The popular healthcare stock stumbled late last year. Here are four charts that suggest it's worth another look now. CVS Health (NYSE:CVS) hit a few stumbling blocks that sent its shares about 18.2% lower last year. In particular, losing a contract that included Tricare's 9.4 million active and retired military personnel to its leading competitor Walgreens Boots Alliance (NASDAQ:WBA) will sting in 2017. However, there are plenty of reasons investors might want to take another look at CVS Health now. The company holds a unique position in America's enormous healthcare sector as operator of the second-largest chain of retail pharmacies, and the second-largest pharmacy benefit manager (PBM), with an estimated 89 million lives under its umbrella this year. Recent expansion of its retail footprint to Target stores nationwide, and acquisition Omnicare's position as a leading supplier of pharmaceutical services to assisted living and long-term care facilities could allow the company to continue along its impressive growth trajectory. Let's look at four charts that highlight just how profitable the integration of pharmacy services and retail locations has made the company in recent years to get an idea of where it might be going. CVS Revenue (TTM) data by YCharts. Over the past five years, CVS Health has seen its top line expand about 54%, which is an impressive pace for just about any well-established company. For a titan this large to expand at this rate while becoming increasingly profitable, though, is all the more impressive because the larger you are, the harder it is to grow in a way that moves the needle. Free cash flow is measured as cash from operations minus investment in capital expenditures necessary to keep those operations humming along. You can also think of it as cash available to pay down debts, or return to investors in the form of share buybacks and dividends. Over the past five years, and increasingly in recent quarters, CVS Health's investors have seen trailing free cash flow outpace revenue, growing about 86.8% over the past five years to $9 billion. Plus, it looks like the party isn't over yet. Meeting Omnicare's pharmaceutical needs, plus the recent addition of 1,660 Target locations, could more than offset the losses of Tricare revenue to Walgreens Boots Alliance. The average Wall Street analyst expects the company's bottom line to expand at about 10.7% annually over the next five years. A large part of CVS Health's growth story in recent years centers around success for its pharmacy services segment. The number of lives its PBM can claim under management has grown steadily in recent years; and, based on estimates, it appears to be accelerating. Although a slightly lower-margin business than its retail and long-term care segment, pharmacy services contributed about 44.6% of consolidated total operating profit reported during the first nine months of 2016, up from 42.2% during the same period in the previous year. Since PBMs derive their negotiating power from the number of patients they represent, this segment's size is its greatest advantage. It's nice to see that advantage become stronger. 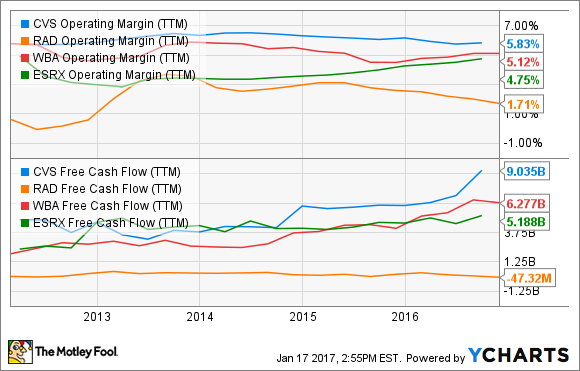 CVS Operating Margin (TTM) data by YCharts. At just about every opportunity, CVS Health likes to boast about cost-saving opportunities it enjoys by maintaining a range of integrated services that feed and support its retail pharmacy network and PBM, such as long-term care facilities and retail clinics. Touting future cost savings to justify acquisitions is standard practice in any industry, but CVS Health has the figures to back up its claims. Over the past five years, CVS Health has enjoyed slightly wider margins than its main retail competitor, Walgreens Boots Alliance, which has a slightly larger retail footprint, but lacks a PBM. Rite Aid's inability to maintain positive free cash flow despite its position as the third-largest chain of retail pharmacies in the U.S. is another illustration of just how difficult it is to maintain profitability in the generally low-margin retail pharmacy space. CVS also boasts a wider operating margin than its biggest competitor in the pharmacy benefit manager space, Express Scripts. The 2015 acquisition of Omnicare set CVS Health up with a big channel to connect its existing services to the growing needs of America's senior population. Management contends it can generate roughly $3 billion in cost savings through integration of Omnicare's operations by 2021. Given the company's ability to maintain wider margins than its peers while integrating healthcare services in recent years, I wouldn't be surprised if it actually achieves those savings. CVS Shares Outstanding data by YCharts. 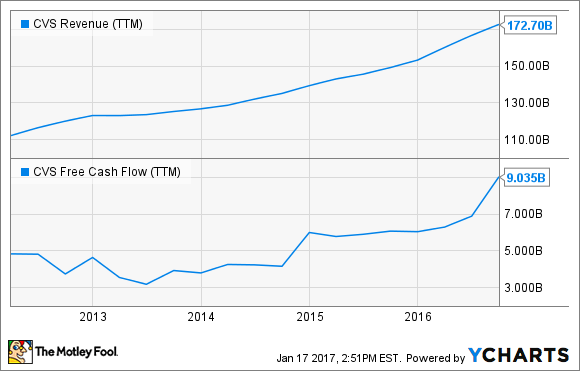 I mentioned earlier that CVS Health grew free cash flow by 86.8% over the past five years to $9 billion. Its shareholders will happily tell you the company isn't shy about giving it back hand-over-fist. 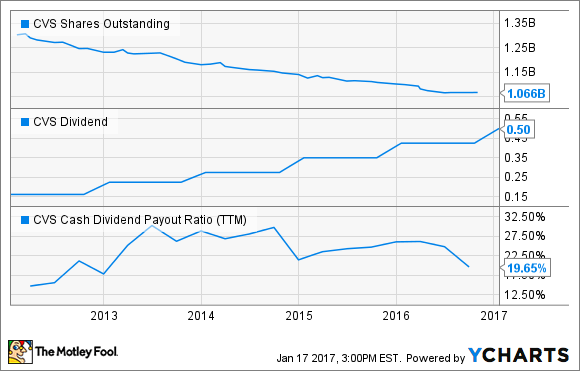 In December, CVS raised its quarterly dividend payout 17.5% to $0.50, which at recent prices offers a fairly attractive 2.4% yield. Granted, there are some healthcare stocks offering higher yields at the moment, but long-term investors could come out ahead several years from now if the company can maintain the pace of dividend growth it's exhibited in recent years. Over the past five years CVS Health has increased its payments at an astounding 25.2% annual rate. You might expect profits to be stretched pretty thin after years of boosting payments at such a pace, but there's still plenty of room for further increases. Over the past five years, the company has bought back about about 18.5% of its outstanding shares. With increasing profits to spread over a smaller share count, the cash payout ratio, measured as the percentage of free cash flow used to make dividend payments over the past 12 months, is at a very comfortable 19.65%. With plenty of cash to distribute to shareholders and make strategic acquisitions, CVS Health looks like it can continue rewarding investors for many years to come.